The name Askacurator can’t change but it is open to ‘Museums’. #AskaMuseum might alienate Art Galleries in some countries. 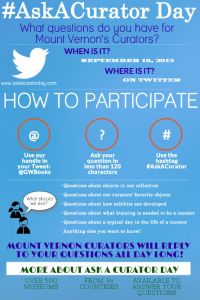 How about we get the word out now that #askacurator 2014 is open to EVERYONE in museums – sound good? The museums who jumped in and answered questions got more out of it. You can’t wait around to be asked questions. There are plenty of general questions that are waiting to be answered. Also, feel free to ask questions! Museums/curators talking to each other. For some reason, 2013 saw a rise in conversations between museums of all sizes and topics chatting with each other. Museums asking questions themselves. I saw a few museums asking questions that they were curious about – not just related to their own museum but to the sector globally. It was fantastic to see them recognize this day was a chance for them to find out things too! A very heartfelt thank you to everyone who took part. 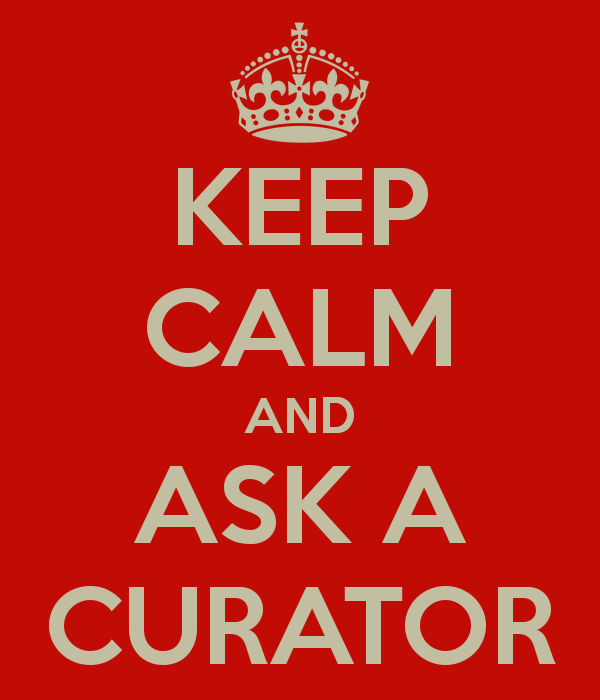 #AskaCurator is participatory and only works when we all get involved. Heartfelt thanks to @chin_rcip for sharing #askacurator stats with me: September 18, 27,311 tweets w/ a reach of 349.8 Million. Please note: I’m not one for number crunching, analytics or caring ‘what can be read from the day’ but understand that it’s important for those that took part to understand *why* and *how* it works. For me, it is enough to say it worked because people said they enjoyed it. I’ve done a few shout outs to see if anyone would mind running a Tweetreach report but no takers so far. If anyone wants to do the numbers, please feel free! That tweet was * exactly * what I wanted to. And I was glad to see curators themselves ‘got’ #askacurator day. It was important that curators/museums didn’t just wait to be asked specific question but to also dip into the tag and find questions to answer. A few Re-Tweets helped get the conversations going. @jillienej: To any/all curators: Is there anything in your museum that you find so creepy/disturbing that you don’t like to work with it? @LakeGeorgeArt: @jennifuchs @CndnCanoeMuseum There’s a Canadian Canoe Museum?!! Slap-to-Forehead! Duh, [Follow] #AskACurator comes through big! @KimberlyHahnArt: If you could curate an exhibition, without regard for the audience, institution where you work, & money, what would you do? @Michael_Hale: To all curators out there, what’s the biggest disaster you’ve ever had? @curiousother: Curators in the Twitter world: How has the digital age change your practice? Making it more mobile, accessible, complicated? @Andreabgood: How many different languages offers your museum (guided tours,audio guides)? @Sascha_Foerster: Is it allowed to take pictures of photographs exhibited in a museum and use them for a blogpost about them? @zoydal: @MuseumRotterdam @AskACurator I hear of the “new” van Gogh. Was rejected in the 90’s. What took people so long? @FrogCranky: #AskACurator @austmus Does nesting Tawny frogmouth hunt at night or does it’s partner bring it food day or night? Does M or F sit on nest? @NicholsonMuseum: oo fun q @Michael_Hale_ What do you think @michaelmuseums? ‘What’s the most fascinating thing about Sir Charles Nicholson? ‪@ScienceGallery It’s #AskACurator day! We’ve displayed radioactive artworks, restarted pig hearts, and held a funeral for an exhibition. Ask us anything. @GabeMoshenska: Curators: how frequently do you shout “It belongs in a museum!” in the voice of Indiana Jones? @michaelmuseums: Has any curator found inspiration for an exhibition via Twitter? @wlate17: Best question “@DavidMentiply: Should museums be free? #askacurator” Hope reply is YES. Museums there to instruct not just to preserve. @LMuseums: @erikajoy Thanks for your great contribution to #AskACurator Would you like us all to sing you “Soft Kitty“? @STOYTE: In all my twitter lifetime, today is the day I have had the best feed! 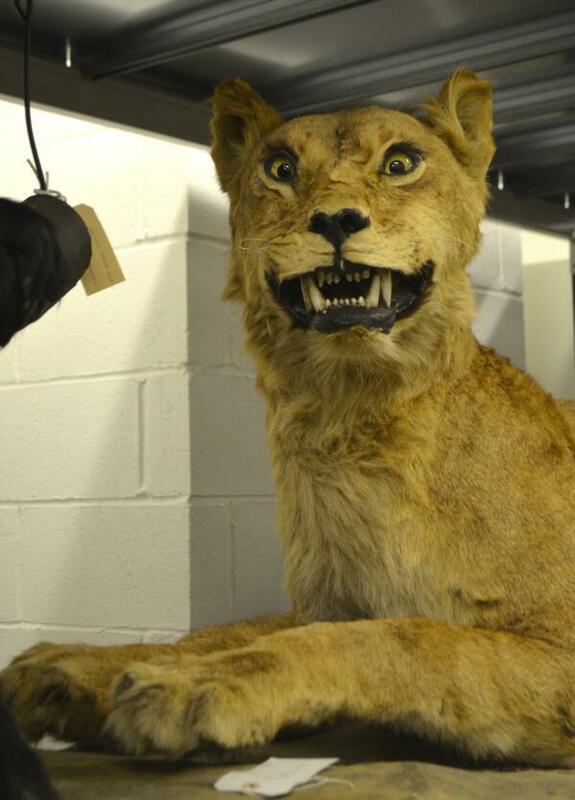 #AskACurator is awesome!! @__publicpervert: it is a big privilege to be receiving replies from some of the greatest curators in the world, I love this day! @Guggenheim: @AskACurator Thanks for organizing such a great initiative! @polarmuseum: From @cowgeography: My year 7 class would like to know ‘How cold would it have to be for a polar bear to freeze?’ Top question! @OshawaMuseum: @AskACurator The q. we were asked by @AndreaArriet: What is the smallest artifact in our collection-a different question that made us think! @TCMIndy: Q: An exhibit you’ve always wanted to curate? | A: The stories kids tell their dolls & teddy bears when no one is around. RT @TCMIndy: @MarDixon My museum also had a TON of fun with “Which object is most likely to come alive at night and cause mischief.” Some cute answers. @cgilesmiller: It was – do you have to be an obsessive to be a curator? @trendinaliaUS: Did you know that #AskACurator was Trending Topic on Wednesday 18 for 3 hours in United States? @MGNSW: PRT @mspenm: What a phenomenon #AskACurator 27 responses across the globe to my Q. Just goes to show the level of engagement huh? @MarkBSchlemmer: If you still have doubts abt the magnitude & reach of tweeting as a museum professional, click #AskACurator & peruse 1000s of interactions! 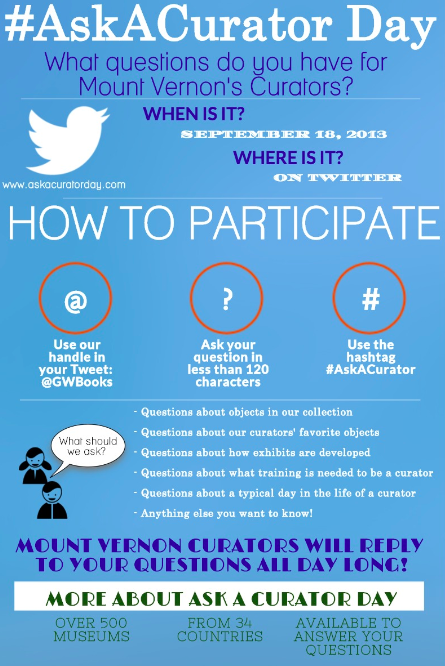 @FlaviaDeNicola: Nice #AskACurator day overview, featuring in particular Italian community: Well done! @GWBooks: Here’s our recap of #AskACurator day Remember: we’re always here to answer your questions. 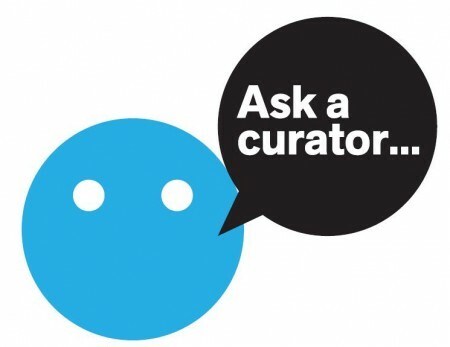 @jesse_a: We have put together a Storify for @I_W_M’s #AskaCurator experience. Great day yday – thanks! @jennifuchs My #AskACurator #Storify – see how over 30 different #museums answered my same 3 questions! Is this only once a year? I’d love to be able to have my students ask a curator when they have a big research project! Middle/HS students…thanks! Sorry for the delay in responding. Ask a Curator is once a year but you can always ask questions to museums (who are happy to pass the message along usually). Thanks! I would appreciate it very much, if you add this to you post.